At weClean we believe in providing top notch customer service to all our clients. We are a owner Managed and Supervised which means we are hands on and only a call away. We provide weekly site visits which are often unscheduled so we can monitor the performance of our cleaners on site. These site visits also give you, the client an opportunity to speak to us about any concerns regarding our service. We also top up chemicals and check the condition of our cleaning equipment. When necessary we will replace mops, brooms and cloths. Each site also has a checklist which can be drawn up to suit your cleaning requirements. Each week we provide a site visit report to our clients indicating any areas of concern that has been picked up. For our commercial and Body Corporate clients we also offer the option of changing light bulbs where necessary. We cover most areas for cleaning service Cape Town, Southern Suburbs, Northern Suburbs, CBD, Atlantic Seaboard and Southern Peninsula. All our contract cleaning clients receive discounted pricing on our other cleaning services such as carpet and office chair cleaning. All our cleaners go through our vetting processes where check all references thoroughly. A criminal record check can also be done for those clients choosing this option. 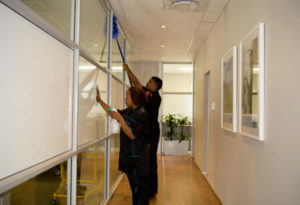 The benefits to choosing a cleaning service like weClean is that we take care of the hassles such as UIF, WCA and Provident fund so that you can take care of your core business! Besides our cleaning service Cape Town, we can also offer the supply of hygiene equipment and chemicals. We deliver in the Cape Town area but can also courier Nationally. We are trusted and reliable, speak to our current clients about our service to find out why they chose weClean Professional Cleaning Solutions.